AUSTIN – After a long, hot summer, many Texans are looking forward to going outside and enjoying the long-awaited cool weather this holiday season. Starting Nov. 30, the Texas Parks and Wildlife Department will be stocking thousands of cold weather-loving rainbow trout at ponds, lakes, and rivers statewide so that family members of all ages can enjoy the crisp seasonal air and catch a feisty, colorful sports fish for fun or prepare a tasty meal. With 170 locations stocked throughout the state, from El Paso to Texarkana and everywhere in between, most Texas anglers are likely to find a place close to home to enjoy catching these fish and spending time in the outdoors. For urban and suburban families in major cities, Neighborhood Fishin’ lakes offer some of the best opportunities to catch rainbow trout this winter. TPWD manages 19 Neighborhood Fishin’ lakes statewide in most major urban centers, including Austin, Dallas-Fort Worth, Houston, and San Antonio. These lakes are stocked with rainbow trout every two weeks and offer plenty of amenities so that family members of all ages can enjoy a fun and relaxing day fishing and connecting in nature. For anglers interested in tailrace fishing, TPWD will be stocking rainbow trout below several dams and spillways, which often have cold water and provide excellent conditions for trout fishing. This year, TPWD will stock rainbow trout into the Canyon Tailrace on the Guadalupe River below Canyon Lake, the Lewisville Tailrace located on the Elm Fork of the Trinity River below Lake Lewisville, and the Possum Kingdom Tailrace on the Brazos River below Possum Kingdom Lake. Other stocking locations include dozens of local city and county managed park ponds, the Texas Freshwater Fisheries Center casting pond, and several rivers including the Frio, South Llano, and Guadalupe rivers and the Clear Fork of the Trinity River. 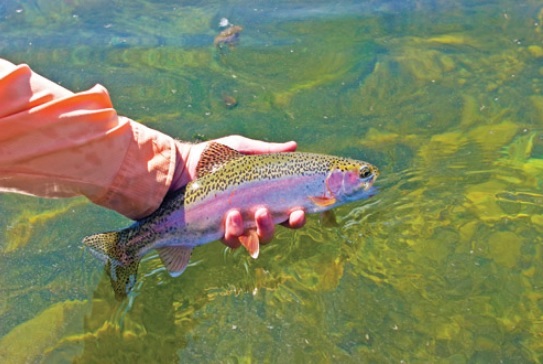 You can catch Rainbow trout on a variety of baits and lures. Depending on an angler’s experience level and interest, some use simple, light tackle or on hand-tied flies using a fly rod. Other tips to consider when trout fishing include arriving early to stocking sites on stocking days, maintaining a safe and courteous distance from fellow anglers, keeping an array of baits and lures nearby and having ice available when harvesting trout to keep fish fresh. TPWD will be stocking a total of 322,568 rainbow trout at all locations from Nov. 30 through the beginning of March. Because rainbow trout are unable to survive in Texas after the winter, anglers are encouraged to keep up to their daily bag limit of five trout. Rainbow trout are an attractive, tasty fish found on many restaurant menus, and anglers can easily find recipes to prepare these fish online. In Texas, children under 17 fish for free, but adults must have a fishing license in the family. An angler fishing in a Community Fishing Lake or from a dock, pier or jetty within a Texas State Park may use no more than two poles. The statewide bag limit is five trout, except on parts of the Guadalupe River where special-limits are in effect. For more winter trout stocking program, and angling tips, or to find a rainbow trout fishing location near you, or to find stocking dates visit tpwd.texas.gov/troutstocking.